The Community of Protestant Churches in Europe is to be put in the position of bearing more prompt and prominent witness than hitherto in current important questions of politics, society and the ecumene, and especially of developing the presence of the Protestant churches at a European level. Thus the 5th General Assembly of the LCF in Belfast in 2001 established the task in social ethics. The 6th General Assembly of the CPCE in Budapest in September 2006 added that the representation of a “Protestant voice in Europe” and a resolute appearance of the church over against the political institutions of Europe are particularly important and should be promoted further. The work of the CPCE in social ethics is being coordinated in Brussels by Frank-Dieter Fischbach, a member of the Commission for Church and Society of the Conference of European Churches (CEC). In addition the CPCE has called into being a “group of experts on ethics”. 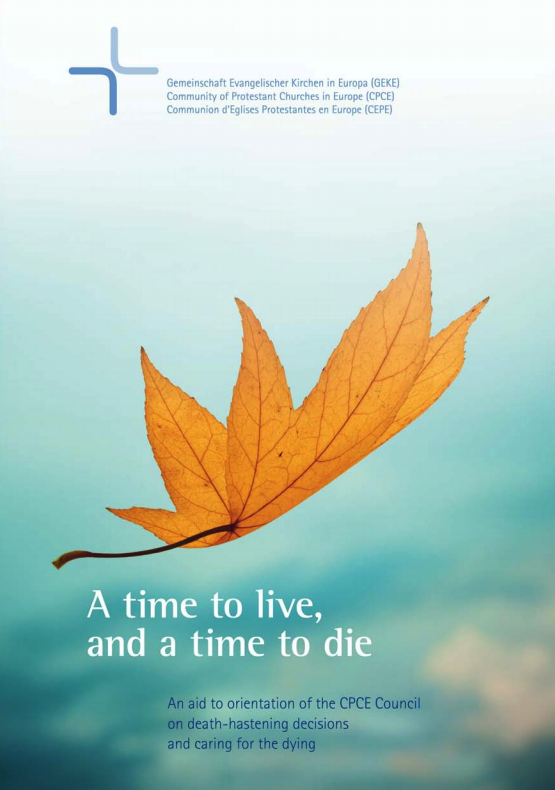 “A time to live and a time to die“ is the title of an aid to orientation on medically assisted death and aid to suicide. The study is the fruit of an intensive process of consultation between 105 CPCE churches in 30 countries on the basis of a text by the CPCE special group on ethics. With the document presented in summer 2011 the protestant churches in Europe contribute their position to the discussions about a worthy approach to the end of life. The 104 page brochure discusses fundamental questions of dying in the social, clinical and juridical context. It asks from theological and ethical perspective: What is human life? Where does our moral responsibility lie? How sensitive are we to the wishes of the patient? Here the aid to orientation takes up such central questions of medical ethics as the termination of life-extending measures, palliative care, assisted dying and suicide assistance. The study emphasizes the necessity to improve the accompanying social, medical and caring conditions for a worthy life and dying. These include the extension and development of hospices and the advancement of palliative care in theory and practice.